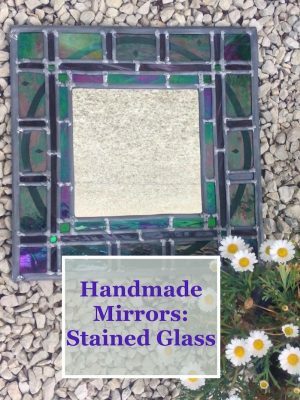 What a surprise I had when I sold one of my handmade mirrors last March! It was late one Sunday evening and I clicked on my Etsy shop’s dashboard, not expecting to see any sales. Behold there was an order for a large green mirror and a princely sum waiting for me. Luckily, the customer had seen beyond the ropey photo I’d taken on my iPhone of a previous creation. 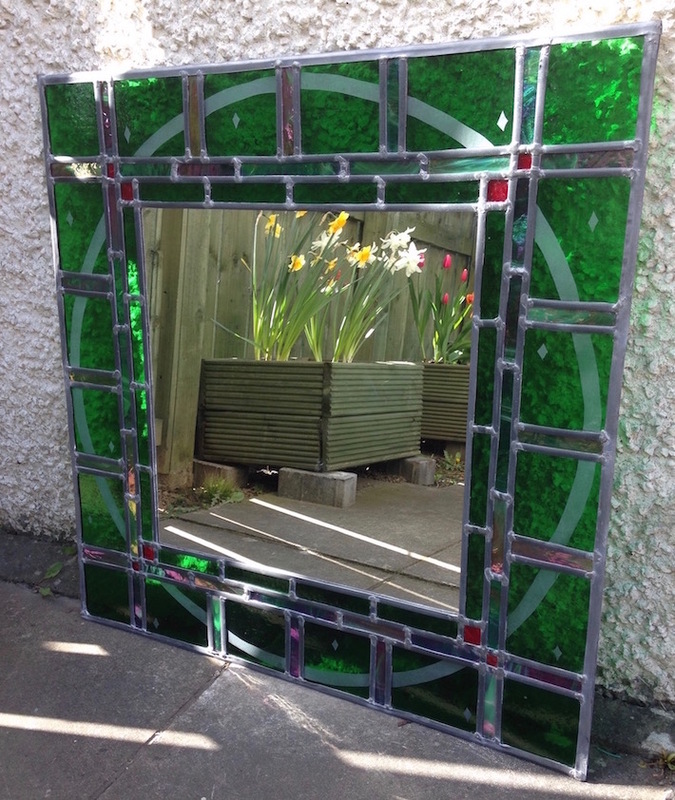 Now he would commission a mirror of his own, as close to the green one in my Etsy shop as possible. Since then sales have been gathering speed. I’ve just finished one with a purple frame. Plus one of my resolutions for 2018 is to finish the ones I’ve started to prepare in my studio. Meanwhile, here is a pretty good photo of another mirror, albeit smaller, taken by my pal Jacqueline. It was a wedding gift and snapped here looking pretty snazzy in her garden in Italy. 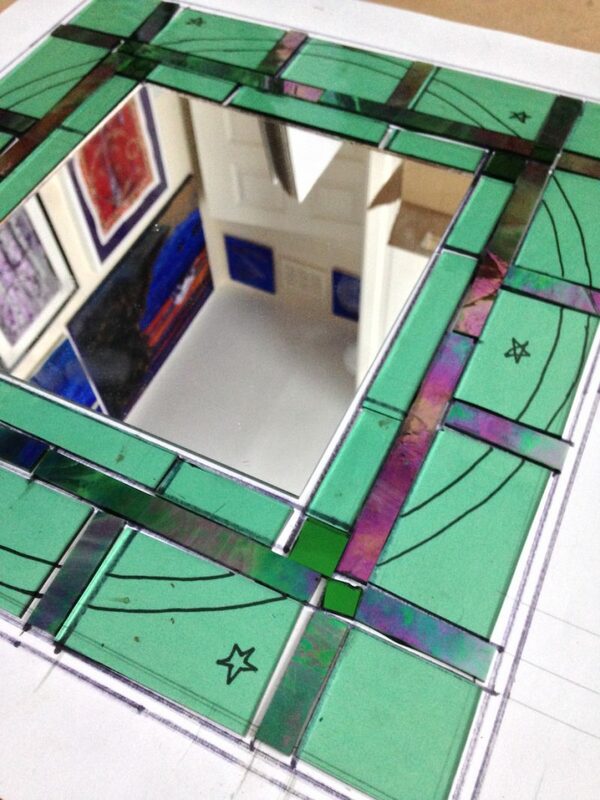 I first started making mirrors with leaded light surrounds as I wanted to have something practical to offer clients. Stained glass and leaded light windows in homes are often luxuries. Offering potential clients an item they could use has proven to be a good move. Furthermore, it goes without saying that mirrors lighten a room and add space. 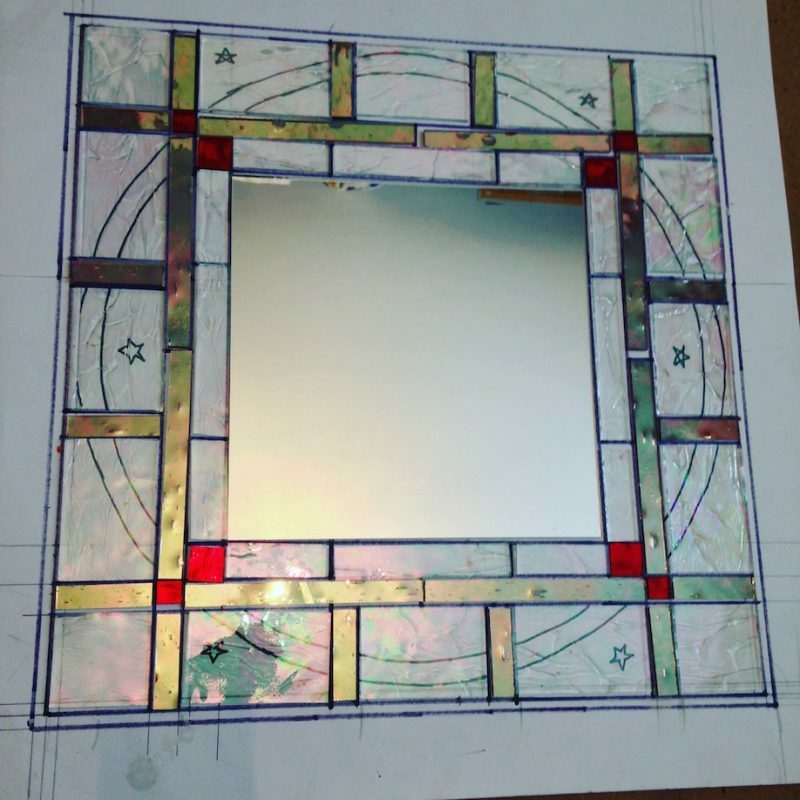 Although some of my mirrors are similar, I may vary the glass that I use or the sandblasted pattern around the edge. My most popular ones are square with a sandblasted circle around the outer rim which I may embellish with a few stars or diamonds. I have also added borders of foliage, elephants and dates marking a couple’s wedding and anniversaries. 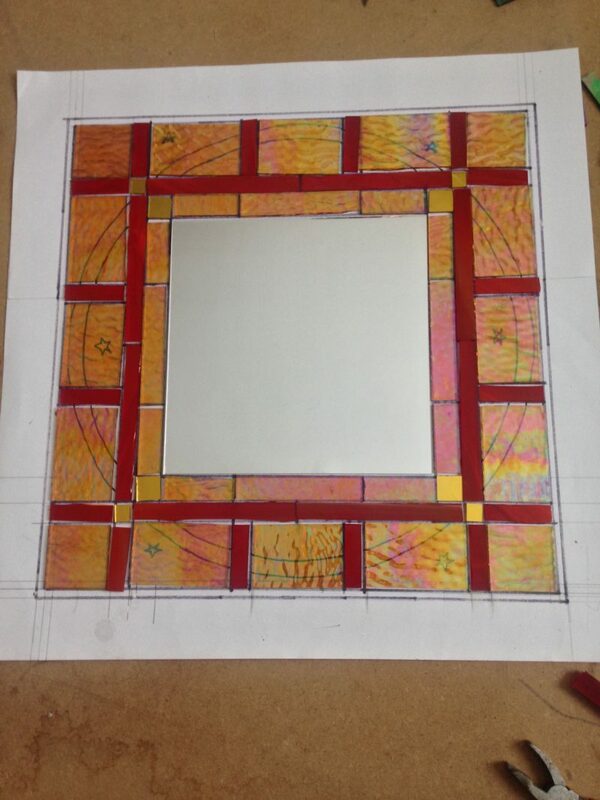 The process is similar to constructing a leaded light window since I lead up the various pieces of glass. Once finished, they can be fixed onto the walls with mirror corners. Naturally, they look best against a white or pale wall so you can see the colours. Light coloured walls seem to be more popular these days anyway as they make spaces look bigger. First step is to buy the glass. When I lived in London I would use Lead and Light in Camden and I now go to Stained Glass Supplies in Glasgow. Nowadays most companies do mail order, so check out the Creative Glass Guild in Bristol which looks like a veritable Aladdin’s Cave. 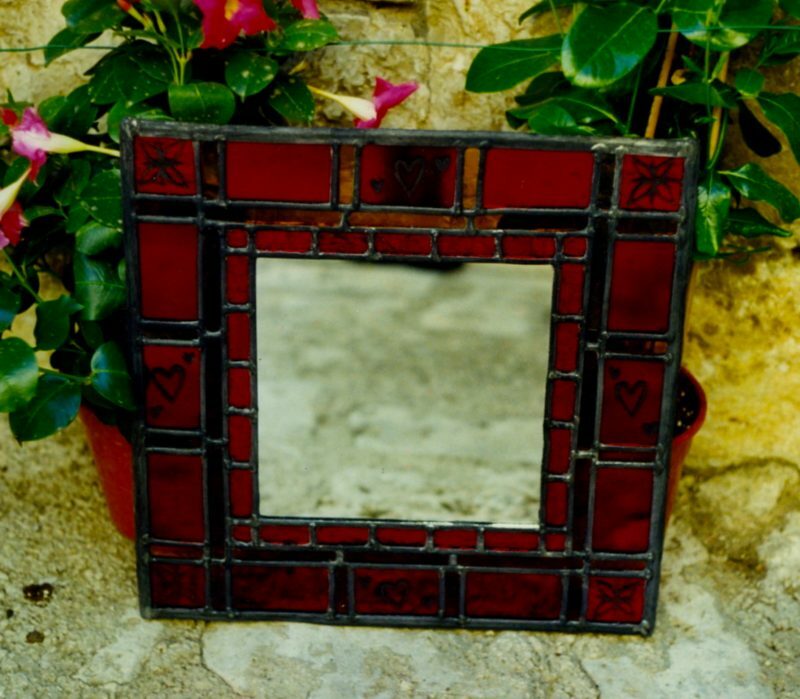 Each of my handmade mirrors has a decorative border created with three different types of glass. The widest section on the outside is the main colour: say a bright yellow. This is where I add the sandblasted pattern. The primary colour is the same as the inner border (directly beside the mirror itself). I use a secondary colour as a thin, inner border like an orange glass with a silvered back (subject to availability). This colour also goes between the wider, outer pieces. Lastly, I add a third colour, small squares where the pieces meet, also using a silvered glass. These small dabs of colour, gold for instance, really set the finished piece off. A big order is exciting, especially if it’s going halfway across the world. But how was I going to send it? It was the first mirror order I’d had on Etsy and I had to find a way to send it. 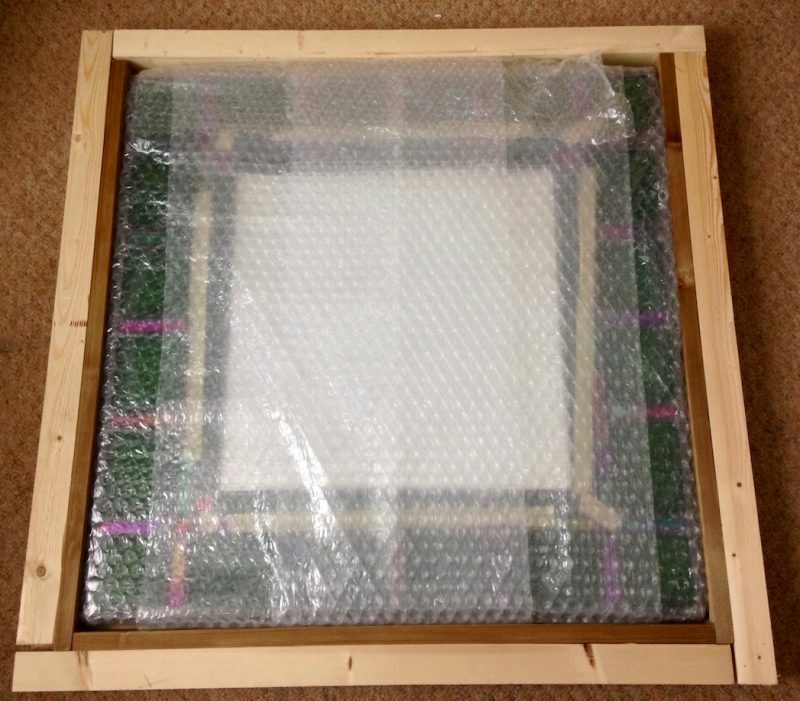 My 80 x 80cm mirrors weigh 15kg and it needed to travel from Glasgow to London in pristine condition. And at a cost that would not dissuade the customer from ordering. Put a square of see-through plastic over the surface for the customer to peel off (and I do this during the construction process itself). Covered the whole piece with two layers of bubble wrap (with the larger bubbles). Added another cover, this one of thick, brown paper. Created a case to send, pictured here with my lovely assistant. Stephen made it by putting four batons around a 90 x 90cm square of MDF. Padded out any gaps with spare batons of wood then fill any smaller spaces with polystyrene worms. Added a final layer of bubble wrap. Securely screwed down the lid (actually, my lovely assistant did that!). Wrapped it with thick brown paper so that the package would look neater when it arrived. Stuck on the delivery note plus personalised stickers with my website address from Moo.com. For this item I used Parcelforce which allows me to send up to 20kg for a reasonable price. There was no need for a Customs Declaration because it was going within the UK, although I did have to stipulate what it was. If you’re not sure exactly what to charge for P&P then overestimate. You can always return an overpayment later (or offer it towards the cost of a future order!). Don’t forget insurance costs for shipping and look into this well in advance of sales. We took it to our local post office for delivery, although for a little extra Parcelforce will collect. 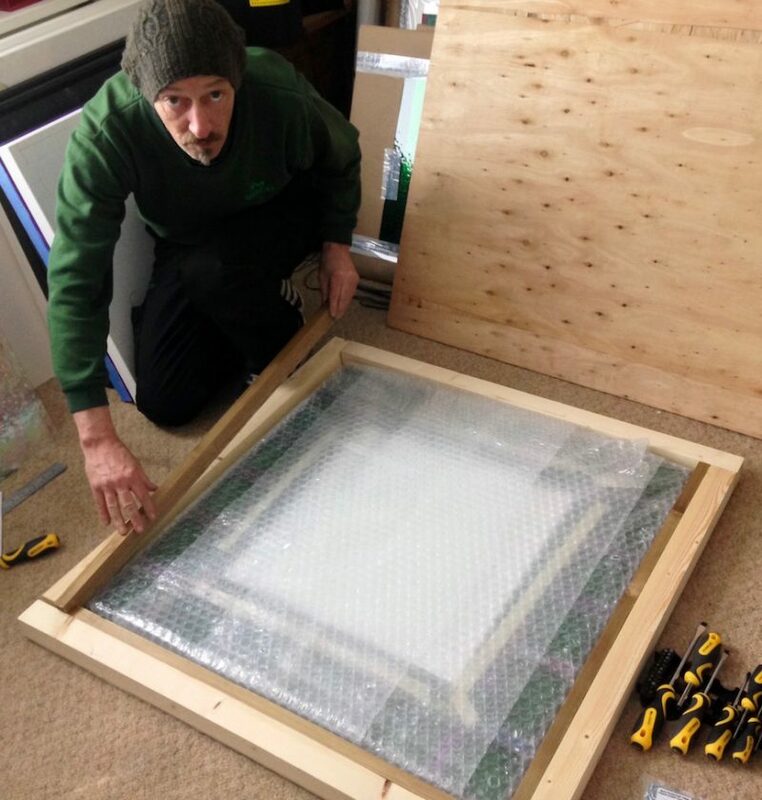 In the past I’ve also been happy with DHL, to send paintings within the UK. They’ve always arrived in good condition and I’m pleased to say so did this big green beauty. Consequently, I’m now confident about delivering my my glasswork in future. One thing that worried me about advertising my handmade mirrors online was a customer not being able to collect in person. I didn’t need to use a particular art delivery service, but here are a few suggestions on specialist shippers on Artquest here. It goes without saying that whoever you choose to send your work with, you must be able to track it. Larger items will always be tracked, but don’t be tempted to save a few pounds if you’re sending something smaller via Royal Mail. Tracking means your item is unlikely to go missing in transit (which regrettably can happen), reassures the customer and lets you know the goods reached their destination. What tips do you have for posting and packaging? Let me know in the comments section. "The Cotswolds: A wee winter stoat about"
"Life Drawing: Facing my Demons"